A Bronx Tale is a 1993 American crime drama directed by Robert De Niro and produced by Jane Rosenthal. 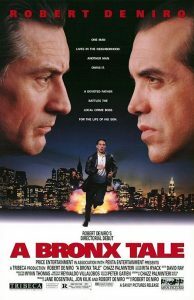 The screenplay was written by Chazz Palminteri and is based on a play written by Chazz Polminteri also called A Bronx Tale. A Bronx Tale stars Robert De Niro, Chazz Palminteri, Lillo Brancato Jr., Taral Hicks, Francis Capra, Joe Pesci, Kathrine Narducci, Clem Caserta, Joe D’Onofrio and Louis Vanaria. A Bronx Tale is the story of Calogero Anello (Lillo Brancato Jr.), an Italian boy growing up in a Bronx neighborhood in the 1960’s. As a 9 year old boy, Calogero witnesses a murder right outside of his building where mob boss Sonny LoSpecchio (Chazz Palminteri) apparently shoots a man over a dispute over a parking space. The police come and ask Calogero’s father Lorenzo Anello (Robert De Niro) to bring Calogero down to the street level to identify the shooter. Sonny and his crew are all lined up in front of Sonny’s Social Club and the police go down the line asking Calogero who shot the man. Calogero looks at each man and says no. The last in line is Sonny and he looks him in the eyes and says no. From that point on, Sonny befriends Calogero over the objection of Lorenzo. Calogero sneaks out any time he can and spends time with Sonny and delivers drinks to his patrons and collects tips. Lorenzo tells Sonny to leave his son alone and Calogero continues. All of the mobsters have nicknames and Sonny tells Calogero that his name is too long and reduces to to simply ‘C’. Fast forward 6 years and C is in High School and hangs with his wannabe mob friends who are always starting trouble. Sonny tells him to not hang out with his friends and to stay in school so he gets two educations. One from school and one from the street. At school, C develops a crush on Jane Williams (Taral Hicks) and asks Lorenzo and Sonny both for advice because Jane is a girl of color which might be frowned upon in that neighborhood in the ’60’s. Lorenzo tells Calogero that it would be best to date a white girl and Sonny is supportive of C’s feelings and tells him he should pursue it stating you get three great loves in your life and Jane could be one of them if she passed the ‘Sonny Test’.